Despite its price, the SL300 packs in a decent 30x zoom lens. It also boasts of an electronic viewfinder though it's not very bright or sharp and we mostly used the LCD display to frame our pictures. On paper, this shooter looks good, but don't expect miracles in terms of performance from it. Still, given its price, it's a decent deal if you are looking to buy a highzoom shooter on a budget. The SL300 is a bridge camera (i.e. 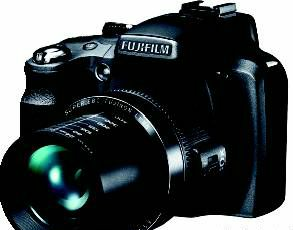 a point-and-shoot with a DSLR-like body) with solid build quality. The lens has a nice rubber grip, while its matte plastic body has been given a thin coating of soft rubber around the screen area. Its size and form factor make it comfortable to handle, and easy to hold steady during shoots. 30x zoom seems good at its price, and pictures shot at maximum focal length come out well when the camera is used outdoors in sunlight. Image quality is good in proper light, with accurate colours. But in low-light conditions - for example, in the evening - images lack sharpness. The main problem is the over-smoothing that the SL300 applies to images This reduces details and makes the pictures look a little washed out. Videos are limited to 720p and grain is visible in footage Besides, you can't use the full 30x zoom during videos Also, the camera lacks ability to record stereo sound.